Search and mobile web is driving patients’ hospital/medical searches. Here’s how. This infographic, produced by Web Direxion in 2012, drew a map from the results of a survey given to over 500 hospital researchers. 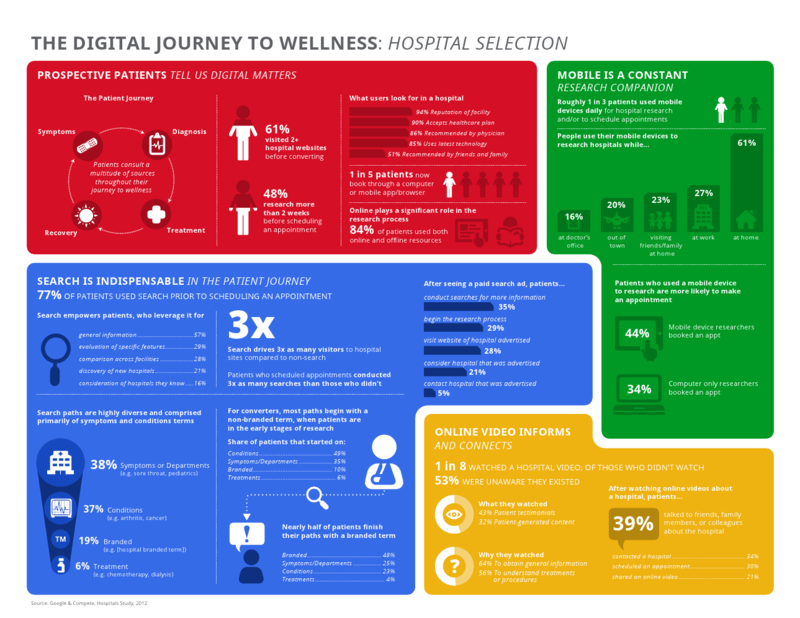 This study, executed in conjunction with Google and Compete, provides timely, and relevant take-aways for hospital administrators today in 2015, as it did at the date of it’s release. 84% of patients use both online and offline sources for hospital research. Search drives nearly 3x as many visitors to hospital sites compared to non-search visitors. Patients primarily search on symptoms and condition terms towards the moment of conversion. 44% of patients who research hospitals on a mobile device scheduled an appointment. Below is a comprehensive summary of the study. You can access the study in its entirety by clicking here. “Eight out of ten people use the internet to research health issues, making it the third most popular online activity,” according to a recent pew study that surveyed 3,014 adults living in the United States. And the numbers of people will keep growing. How is your organization building trust?